Rendering of the nosecone and drogue parachute subassembly. Providing a minimal drag upper aerodynamic surface. Providing an attachment point for the upper shock cord. Securely attaching to the rest of the airframe prior to apogee to prevent any undesired separation during flight. The nosecone is made of fiberglass and is of a 5.5:1 Von Kármán ogive geometry. This geometry was chosen to minimize drag while still providing significant usable interior volume to facilitate using the interior for other purposes, such as storing the drogue parachute. The exact nosecone chosen was the 6 inch metal tipped fiberglass Von Kármán nosecone from Madcow Rocketry. The nosecone’s 6.17in (157mm) outside diameter (OD) and 6.0in (152mm) inside diameter (ID) match the rest of the outer body tubes in the rocket. The nosecone attaches to the rest of the subassembly by way of six 8-32 flat machine screws that thread into adhesive mount nuts inside the coupler section. 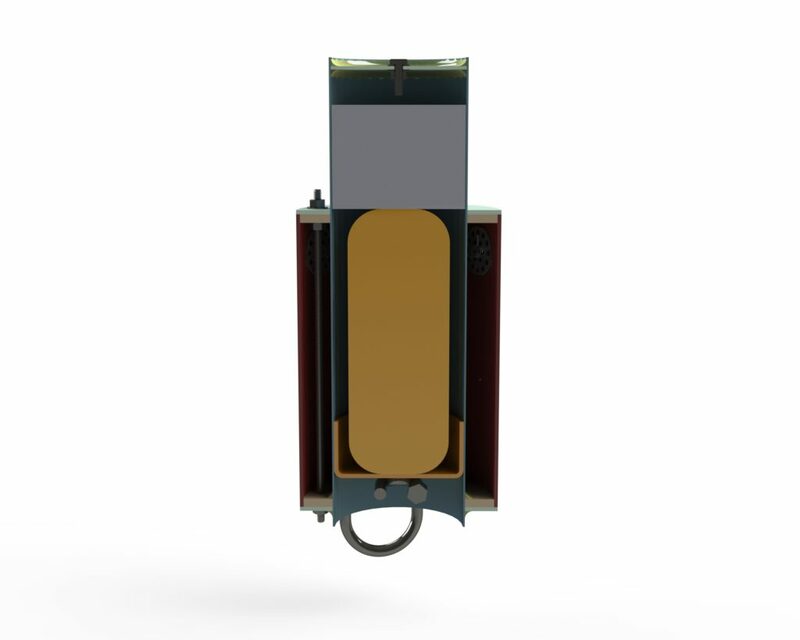 Rendering of the inner components of the nosecone, showing the coupler section and drogue parachute tube. 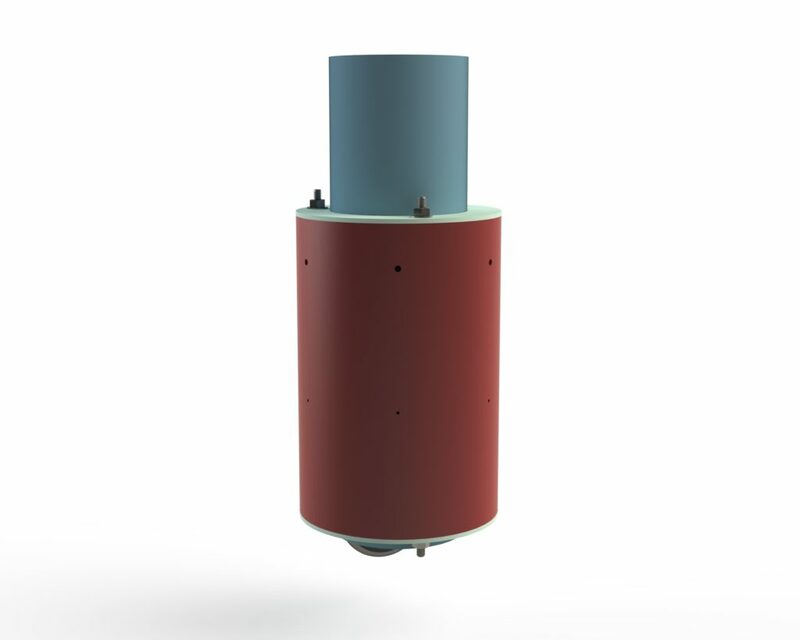 The coupler section is a 6.17in (157mm) OD, 6.0in (152mm) ID and 8.88in (226mm) long section of G10 fiberglass that is included with the nosecone. This coupler section also is attached to the upper body tube subassembly via six nylon shear pins from Apogee Components. A cross-sectional view of the subassembly. Centering rings on the top and bottom of the coupler section are made by layering an outer fiberglass ring onto an inside plywood ring. The outer ring has the same OD as the coupler tube and the inner ring has the same OD as the ID of the coupler. This allows the inner ring to center the assembled rings onto the coupler. These centering rings retain a central 14.0in (357mm) long section of 4 inch blue tube from Apogee Components. This tube will hold the drogue parachute while also drastically reducing the volume that the drogue ejection charge needs to pressurize. West Systems 105/206 epoxy resin and hardener are used to both hold the centering rings together as well as to secure the central tube to the lower centering rings with epoxy fillets on the upper and lower surfaces of the lower centering ring set and the central tube. The centering rings are secured to the top and bottom of the coupler by way of three, 10.25in (260mm) long sections of 1/4-20 threaded rod. Nuts and washers are used on both sides centering rings. These threaded rods will carry the transfer the load from the outer structure of the nose cone to the lower centering rings after the drogue parachute’s charges have separated the subassembly from the rest of the airframe. The drogue parachute chosen is the 44in (1.1m) SkyAngel parachute. This is the same parachute that I have used as my main parachute in my L1 and L2 certification flights. The drag coefficient of 1.87 is similar to other high-power drogue parachutes from FruityChutes and should provide an initial decent rate of approximately 87 ft/s (25.5 m/s). The drogue parachute attaches to the electronics bay and the nosecone by way of two sections of tubular nylon webbing. The lower section is 30ft (9.1m) long and connects to the electronics bay subassembly by way of a 2.75in (70mm) long quick link. The lower shock cord then attaches to the drogue parachute and the upper shock cord via another 2.75in (70mm) long quick link. The upper section of shock cord is a 15ft (4.6m) length of tubular nylon webbing. The other side of the upper shock cord connects the the nosecone by looping through a U-bolt on the bottom set of centering rings. The U-bolt is the same 3/8-16 thread size, 2in ID, 2.625in height U-bolts that used on the fin can and electronics bay subassemblies. The U-bolt is rated for up to a 1075lb (4782N) load and attach through the outer fiberglass and inner plywood layers of the centering rings. 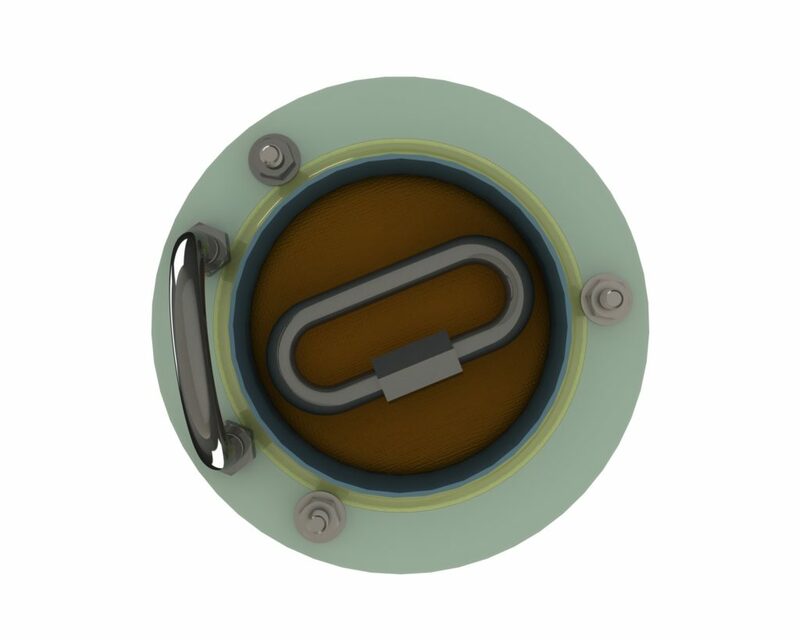 Rendering of the bottom of the nosecone and drogue parachute subassembly. The parachute will be protected from the blast from the ejection charges by way of an 18.0in (457mm) square NOMEX blast protector, shown in orange in the above render. Rendering of the top of the nosecone and drogue parachute subassembly. To seal the top of the central tube, a 3.94in (100mm) OD, 0.125in (3.18mm) thick, G10 fiberglass bulkhead is fitted inside the upper end of the tube. This bulkhead is secured with West Systems 105/206 epoxy resin and hardener. This bulkhead is placed 0.25in (6.35mm) from the end of the central tube. Fillets of epoxy are used both on the upper surface of the bulkhead at the top of the subassembly and on the lower surface, inside the central tube. 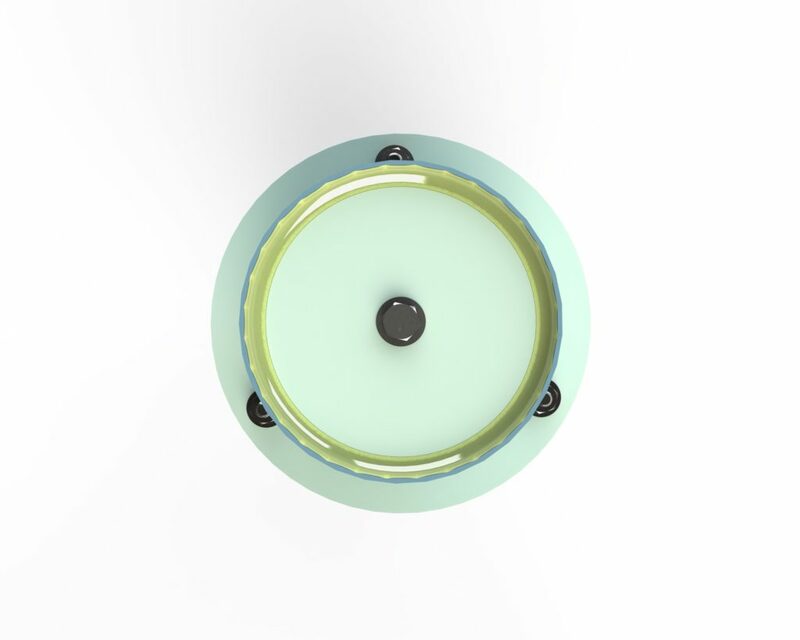 Since the bulkhead has a 0.25in (6.35mm) diameter hole in the center, a 1/4-20 bolt and but, with washers on both the top and bottom surfaces, is used to seal the bulkhead. To determine the amount of black powder necessary to reliably eject the drogue parachute, the internal active volume must be determined and the strength of the shear pins must both be known.. This volume encompasses two tubes of different diameters and lengths from the nosecone and upper body tube subassemblies. The bottom section of the active volume is contributed by the upper body tube. The volume of interest is a cylinder, with a diameter of 6.0in (152mm) and length of 5.6in (142mm). This results in a volume of 158 in^3 (2.59L). The upper section of the active volume is contributed by the central tube from the nosecone. It is a cylinder, with a diameter of 3.94in (100mm) and a length of 13.66in (347mm). This results in a volume of 167 in^3 (2.74L). The total volume is then the sum of these two sections, or 325 in^3 (5.33L). The shear pins are known to require 64.24lbs (285.75N) to shear a set of three in half. Since the design employs six shear pins to secure the nosecone to the upper body tube, the required force is doubled, or 128.48lbs (571.50N). To calculate the internal pressure required to generate this force, the area of the internal bulkhead must be found. Since the OD of the equivalent bulkhead made up of both the centering rings and the upper bulkhead is 6.0in (152mm), the area is then 28.27 in^2 (182.4 cm^2). Dividing the required force by this area results in a minimum needed pressure of 4.54psi (6.89kPa). To ensure that the charges can both fully shear the pins and separate the sections of the airframe, the primary ejection charge nominal pressure should generate 2.0 times the minimum force and the backup charge should generate 2.5 times the minimum force, or 9.08psi (13.78kPa) and 11.4psi (17.2kPa) respectively. In order to use the calculator at NASSA Ejection Charge Calculator, a equivalent length of a constant diameter volume needs to be found. Dividing the total volume by the cross-sectional area of larger diameter tube results in an equivalent constant diameter length of 11.5in (292mm). Entering the needed pressures and equivalent dimensions into the calculator, the amount of FFFF black powder necessary to produce these pressures is 1.52g and 1.91g for the primary and backup charges respectively.